1 lb. Sirloin Tip Steak. 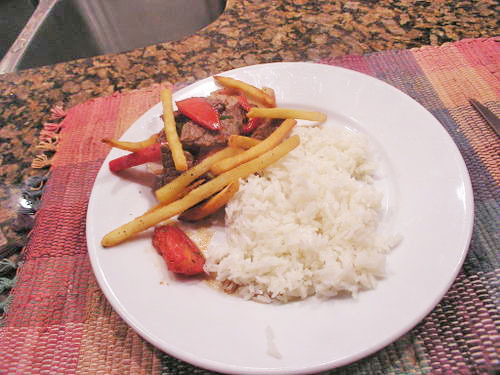 (you can use skirt steak instead). Cut the sirloin tip steak into 1/2 ” strips and set aside. 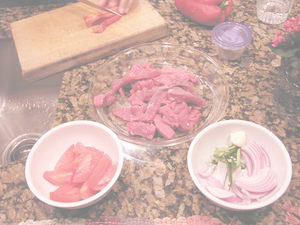 Slice the onions into wedges, green pepper into strips, jalapeno peppers, cilantro and tomato into wedges. Mince the garlic. Set apart and aside. French fry the potatoes and set aside. 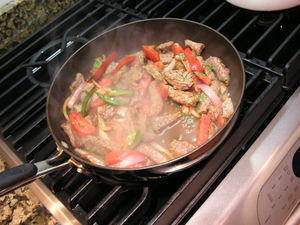 In a hot skillet, quickly seal the juices of the sirloin over high heat. 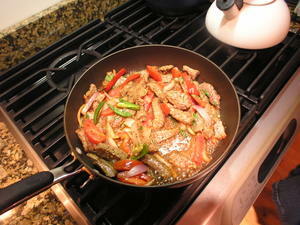 Add the onions, tomato, the garlic, the green pepper, the jalapeno pepper, the oregano, and the pepper. Toss the french fries on top.